President Park Geun-hye, according to a number of her staff at Cheong Wa Dae, is a very meticulous, strict boss. 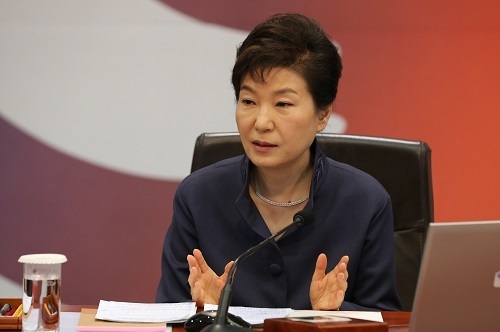 Though it is a staff member’s job to write the first draft of her speeches, Park has, many times, taken a few hours to complete the final version -- replacing some words to add stress or defend against the opposition, and perhaps to express her emotions. After three years in office, her choice of words has become a window to understanding the president, who veils her private life in complete secrecy and barely communicates on a personal level face to face. The president may spend a significant amount of time scrutinizing over the words to best express her mindset and to bring the people to her side. But it is a sense of distance and bitterness that are constantly left behind when listening to her pour out the words that are often provocative and increasingly intimidating. Such words in recent weeks have rocked the nation, particularly when she used the term “abnormal soul” to justify her push to reintroduce state-authored history textbooks. On Nov. 10, Park told her Cabinet members that young people would have no “hon,” meaning soul in Korean, if they do not know the history of their country well. When they learn it the wrong way, it would turn their soul into an abnormal one, she said, adding that it was too “dreadful” to think about. The use of “hon” and her tone of voice that carried the word were so powerful that even the faces of ministers at the meeting were seen to be flushed. Whether out of embarrassment or fear, we may not know. The opposition bloc became furious, too, condemning her for arrogantly branding all people who oppose her plan as having abnormal souls. Hon, according to the Korean dictionary, is a nonmaterial and supernatural thing that controls both the body and the spirit. The term is rather religious, or mystic enough to invoke suspicions by some Internet users that she was being overtaken by the philosophy of Kouksundo, an oriental martial art she is said to have been involved in years ago. It was not the first time Park’s remarks have stirred sensation. There were good times when she successfully used a new catchphrase, saying unification would bring an “economic bonanza,” or calling unnecessary regulations an “enemy that must be crushed” and “a tumor that needs to be removed.” Park was speaking with words that were already overly graphic, but it worked in ways to portray her determination. Over time, however, her words have become more outdated, radical and even threatening. Late last year, Park said she would send unnecessary regulations to “the guillotine.” In June, Park denounced former ruling party floor leader Rep. Yoo Seong-min for what she called the “politics of betrayal” and blamed him for succumbing to the opposition’s pressure to approve a bill she later vetoed. Earlier this month, she blasted the parliament, saying the legislature “won’t be forgiven” by the people if they did not approve the pending bills aimed at reviving the economy. With reasonable doubt, she may have been trying to send a message of urgency and desperation for failing to produce achievements with time cracking on. Her term ends in early 2018. Regardless of what side someone is on, the words increasingly corresponded with tougher government interference and control, leaving the bitter taste of fear, a concept that had been quite foreign since the country’s democratization decades ago. Ruling by fear can be effective to make people act or follow. But this should not be the case for a democratic state like South Korea, and especially for a leader like Park who lives with the mixed legacy of her militant father. Using fear as a method for oppression or as a weapon to end political disputes -- if that was really what she had in mind -- is what we can say is truly abnormal.